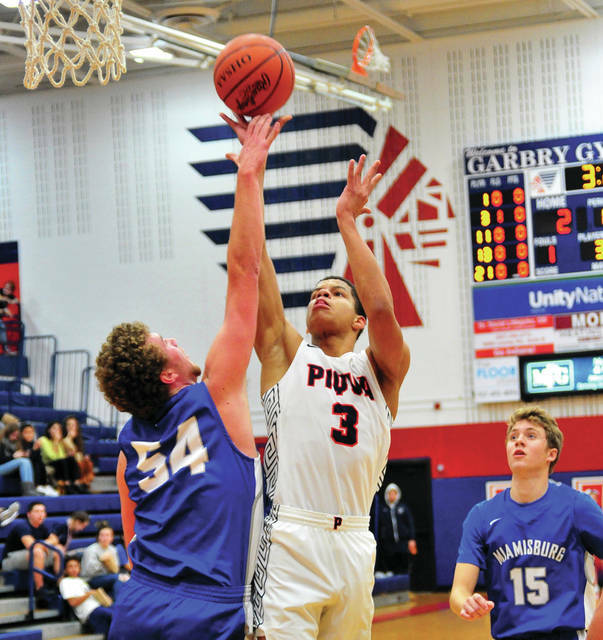 Piqua’s Trey Richmond shoots over Miamisburg’ sDuncan Hall as Alex Ball (15) looks on. Piqua’s Mick Karn hits a 3-pointer as Corey Hartman moves into position for Miamisburg. 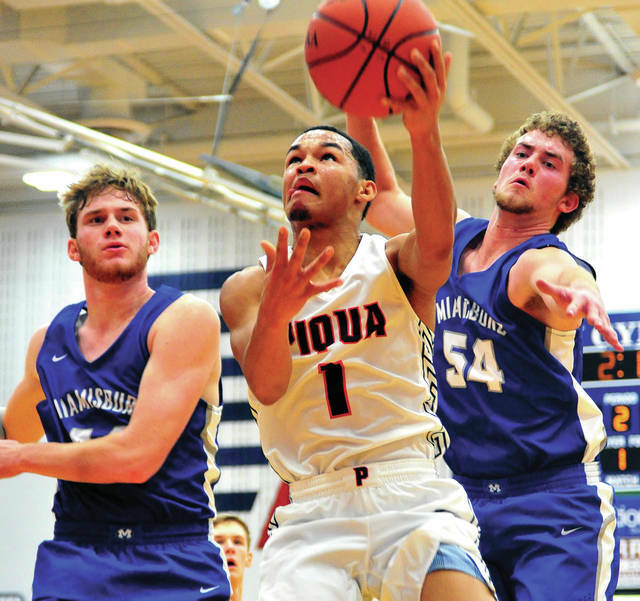 Piqua’s Marquis Jordan drives between Miamisburg’s Alex Ball (15) and Corey Hartman. Piqua boys basketball coach Steve Grasso knew the Indians had a tough stretch to open the season. But, the Indians took a big step forward Saturday night. 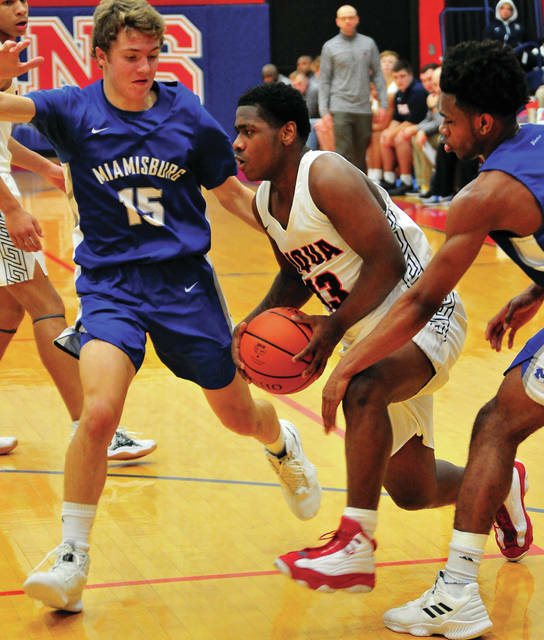 After an opening 72-38 loss to Vandalia-Butler, Piqua took Miamisburg to the buzzer Saturday night at Garbry Gymnasium before losing 49-46. In fact, the Indians got within one on a Mick Karn basket to make it 47-46 with one minute to go. With 53.4 seconds to go, Piqua forced a Miamisburg turnover in the backcourt and had the ball with a chance to take the lead. But, a shot on a drive to the basket was blocked and the Indians had to foul Miamisburg’s Corey Hartman with 14.5 seconds to go. Hartman, who finished seven of nine from the line, hit both free throws to make it 49-46. After Piqua missed a free throw with 8.6 seconds to go, the Indians had one last chance inbounding from under their own basket. But, Miamisburg tipped the ball away with three seconds to go and the clock ran out before Piqua could recover the ball. Piqua stayed close much of the first half. Qurri Tucker closed the first quarter with five points and the Indians were within 9-7. Piqua got down 17-12 in the second quarter as the presence of 6-6 Duncan Hall and 6-4 Dane Hall was a problem for the Indians all night. 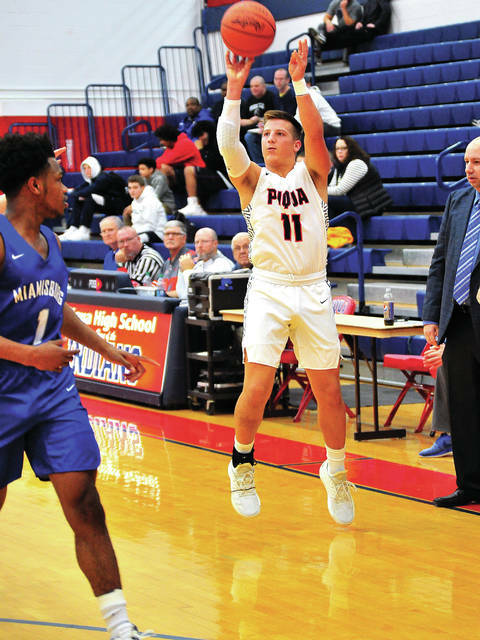 But, Tucker and Karn hit back-to-back threes to give Piqua a 18-17 lead, before Miamisburg scored the final seven points of the first half. Piqua started the quarter with Kameron Darner converting a three-point play off a pass from Trey Richmond to get within 24-21. It looked like the Indians were in trouble, when the Vikings reeled off the next 12 points to take a 36-21 lead. But, Piqua came back with eight straight points of its own. Karn scored, Iverson Ventura hit a three and Tucker had a 3-point play to make it 36-29. Another basket by Karn on the final possession of the third quarter made it 37-31. With Dane Hall scoring four points, Miamisburg opened a 42-33 lead with 4:10 to go in the game, but Piqua would not go away. Tucker hit a three and Marquis Tucker scored to make it 43-38 before Duncan Hall scored for the Vikings to take the lead to 45-38 with 2:51 remaining. Karn hit a three and after two free throws by Hartman, Darner buried a three to get Piqua within 47-44 with 2:15 remaining. It stayed that way until Karn’s basket with 1:00 to go made it 47-46 and set up the dramatic finish. Tucker had 16 points and five rebounds for Piqua and Karn added 13 points. Duncan Hall had 19 points and 11 rebounds for Miamisburg. Hartman had 14 points and seven rebounds and Dane Hall grabbed nine rebounds. Piqua was 18 of 48 from the floor for 38 percent and three of seven from the line for 43 percent. Miamisburg was 16 of 49 from the floor for 33 percent and 13 of 22 from the line for 59 percent. The Vikings won the battle of the boards 37-23 and had 13 turnovers to Piqua’s 14. The Indians, 0-2, will look to get back on track Friday at Tippecanoe. Corey Hartman 3-7-14, Drew Barry 1-1-4, Colin Murphy 0-0-0, Dane Hall 2-3-7, Duncan Hall 9-0-19, Alex Ball 1-0-3, Luke Copsey 0-2-2, Corey Fries 0-0-0. Totals: 16-13-49. Qurri Tucker 6-1-16, Kameron Darner 2-1-6, Trey Richmond 0-0-0, Mick Karn 5-1-13, Riley Hill 2-0-4, Marquis Jordan 1-0-2, Zach Tillman 1-0-2, Iverson Ventura 1-0-3, Zack Lavey 0-0-0. Totals: 18-3-46. 3-point field goals — Miamisburg: Hartman, Barry, Duncan Hall, Ball. Piqua: Tucker (3), Darner, Karn (2), Ventura. Records: Piqua 0-2, Miamisburg 2-0.